Each and every state of India is home to innumerable temples and several pilgrimage destinations. Madhya Pradesh also falls under the same category and hence, hosts some of the most famous religious and spiritual places in the country. One such place within the state is Ujjain, which is said to be have been founded during the Vedic period and is believed to be one of the highly revered religious places in the world amongst Hindus. How about leaving behind your usual trips to hill stations and coastal regions and planning a wonderful trip to this mesmerising city, where you can find everyone savouring the beauty of a calm and composed world? Wouldn't you love to be lost in seclusion and enjoy the best of the human world, where you can certainly find the ultimate bliss in life? If you are looking forward to planning a trip to such an amazing place, then travel from Bhopal to Ujjain this season. Read on to know more about how to reach Ujjain and its sacred places. Located in the state of Madhya Pradesh, Ujjain experiences an extreme type of climate and hence, it is mostly visited during the winters by tourists. However, it remains a year-round destination for Hindu devotees and offbeat travellers, who come here to find peace in life. If you are looking forward to escaping the hot sun, then the best time is from October until the end of March. By Air: The nearest airport from Ujjain is situated in Indore at a distance of around 55 km. Once you have reached the airport, you can either go for a bus or a taxi to Ujjain. It will take you an average time of 1 h to reach Ujjain from Indore. By Rail: Ujjain has its own railway station and hence, you can catch a direct train from Bhopal railway station to Ujjain Junction. By Road: Ujjain is located at a distance of about 190 km from Bhopal and hence, it can be easily approached by road. You must take route 1 if you are looking forward to reaching your destination within minimum time. It will take you an approximate time of 4 h to reach Ujjain through route 1, i.e., 1 h lesser in comparison to other routes. On your way, you can also explore the beauty of Dewas. Dewas is a perfect place to take a break on your journey to Ujjain as you can get in touch in nature at its forests and wildlife sanctuary. It is located at a distance of around 40 km from Ujjain and 150 km from Bhopal and has been ruled by several dynasties in the past. Once a princely state, the history of Dewas dates back to the advent of the Common Era. Hence, you can find several ancient temples and other sites within its boundaries. The major places here include Devi Chamunda Temple, Kheoni Wildlife Sanctuary, Pushpgiri Tirth, Kavadia Hills and Gidya Khoh Waterfall. Dewas is also famous for its small-scale industries. Famous for its temples and other religious sites, Ujjain is located on the banks of the Kshipra river and is the place where the grand Kumbh Mela is held once in every 12 years. On an average, it is visited by millions of tourists and Hindu devotees every year. Regarding history, Ujjain was one of the major commercial and political centres during the Mauryan empire. Since then, it has been under the rule of several dynasties, which include the Delhi Sultanate, the Mughals and the British. As per archaeologists, it is one of the ancient settlements in India, with a history dating back to several centuries before the Common Era. Being a religious town and a pilgrimage centre, the major spots here include temples. Following are the must-visit places to explore while in Ujjain. One of the twelve jyotirlingas in India, Mahakaleshwar Temple is the major pilgrimage centre in Ujjain for Hindu devotees, especially amongst Shaivites. It is also believed that a visit to Mahakaleshwar Temple and taking a dip in the holy waters of the Kshipra river can wash away all the sins of an individual, thereby, letting them achieve salvation. Hence, it is visited by millions of tourists every year. It is said that the journey to Ujjain is always deemed incomplete without visiting Ram Ghat and taking a dip in its holy waters. 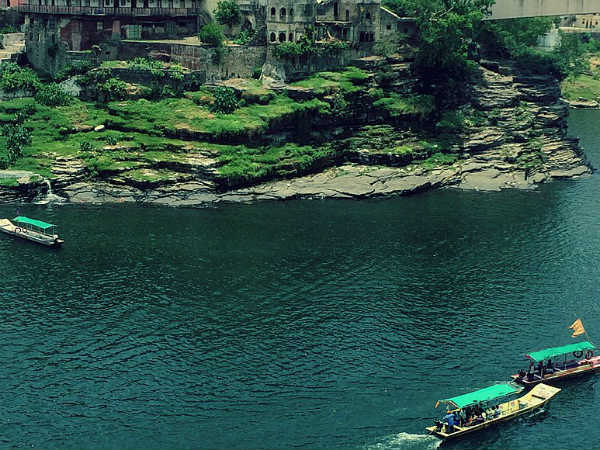 One of the prominent sites in the holy town, Ram Ghat is a must-visit destination for you. Apart from temples and religious spots, Jantar Mantar is the most visited historical monument in Ujjain. It was built during the 18th century by Maharaja Jai Singh and is one of the five observatories in India built by him. Comprising 13 astronomy instruments, it was constructed to measure the altitude of the place and the time, declination of the sun and other planets and to learn about the properties of the stars. Isn't it a wonderful invention from the past? Being a prehistoric city of pilgrimage sites, Ujjain is home to numerous temples. Other significant temples within its boundaries include Chintaman Ganesh Temple, Gopal Mandir, Kal Bhairav Temple, Mangalnath Temple, ISKCON Temple, Harsiddhi Mandir and Chamunda Mata Temple. Apart from all the above-given places, you can also visit Sandipani Ashram, Kaliadeh Palace, Ram Janardhan Temple and Indira Gandhi Statue. So, what do you think of a trip from Bhopal to Ujjain now? Isn't the beauty of this pilgrimage town worth visiting?